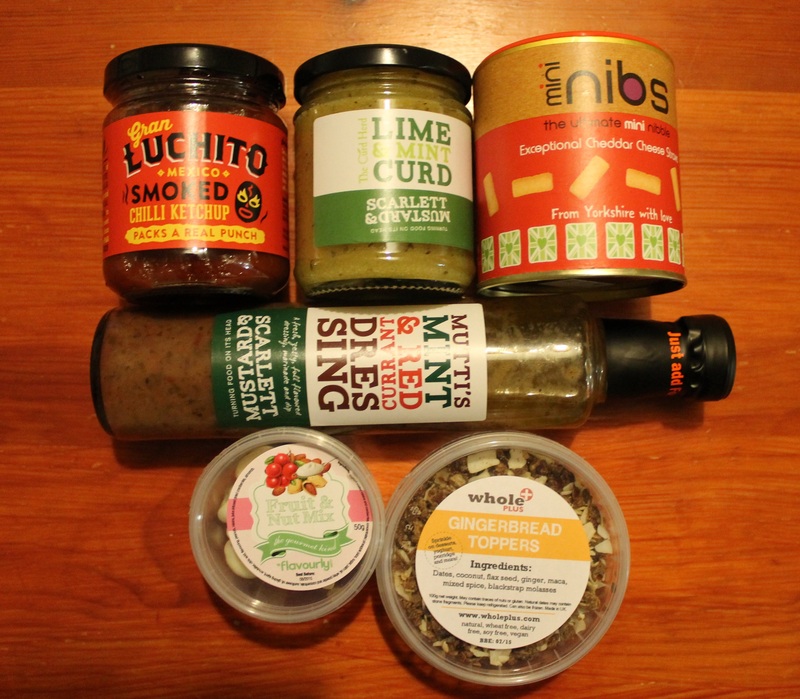 Flavourly box – March 2015 – Tasting the World – On the road, with stuffed hand luggage and face. Camera in my hand. Another load of great stuff came this week. Dried golden berries by Clearly Scrumptious. I had them, I wasn´t very impressed. Bannoffee Meets Chocolate by Choc+. This one is already gone. I tried it yesterday and I liked the combination. I have always liked the combination of banana and chocolate and toffee just adds that little extra. Turmeric and tamarind coconut sugar by Coconom. It´s actually organic coconut palm nectar in granules. I had this one before and I´m happy to get it again. Last time I used it for baking a kind of gingerbread-style cake. 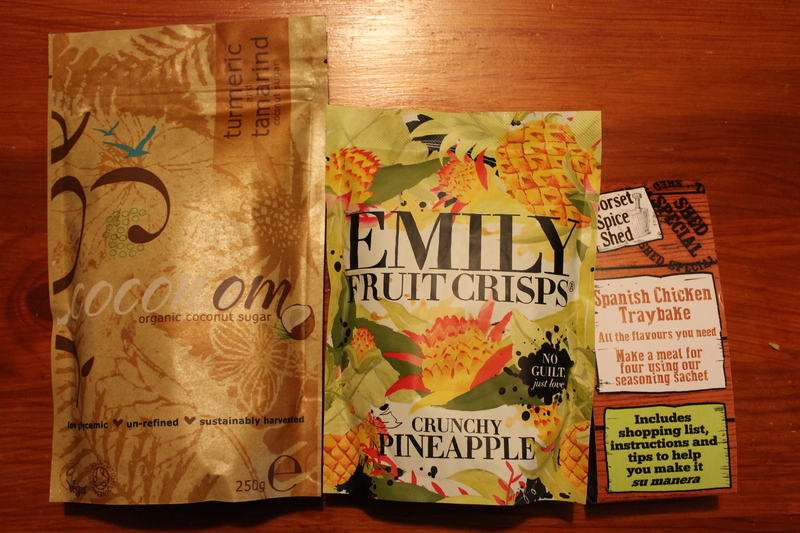 Crunchy pineapple by Emily Fruit Crisps. Yummy, ate the whole bag at once. I like their colourful packages as well. Spanish Chicken Traybake by Dorset Spice Shed (Saison). With barbecue season approaching, this one will definitely find its use. I like that there is a recipe with a shopping list on the package, I always welcome this when I try something new from Flavourly. Gran Luchito´s Smoked chilli ketchup. The same as above applies for this one – bring the sunny BBQ weekends on! Lime and mint curd by Scarlett & Mustard. I like lemon curd, so I have high hopes for lime one. I´m just not so sure about the mint, but it might surprise. Cheddar cheese straws by Nibs Nibs. I had these before and I like them, it´s good to nibble on them anywhere you take them. Mutti´s mint and redcurrant dressing. Mint again. I´m not really sure what to use it for. The guide suggests coucous, potato dishes etc. This is something I will have to experiment with. Any tips? Gingerbread toppers by Whole Plus. Good idea to send this one together with the sugar, I already have some ingredients for a cake! 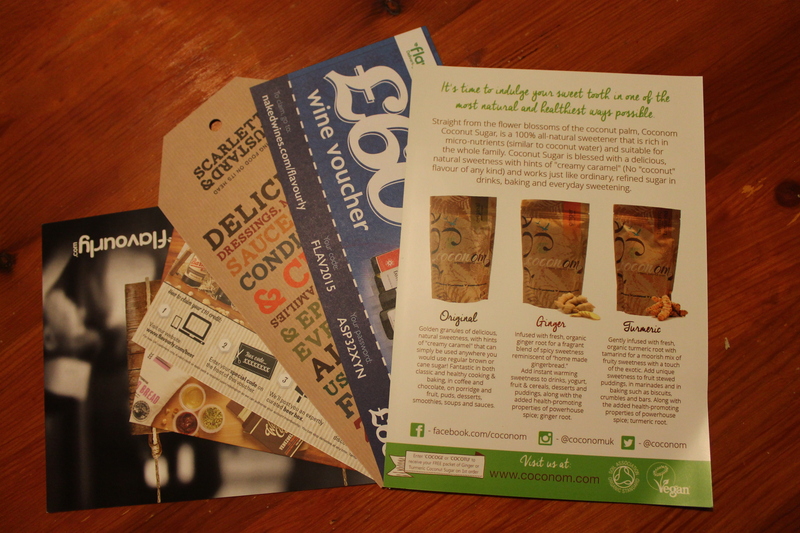 As always, the products are complemented with a guide and selected vouchers. That´s it for the box. There´s some good news from Flavourly – they opened Marketplace, where you can buy your favourite products from the previous boxes. 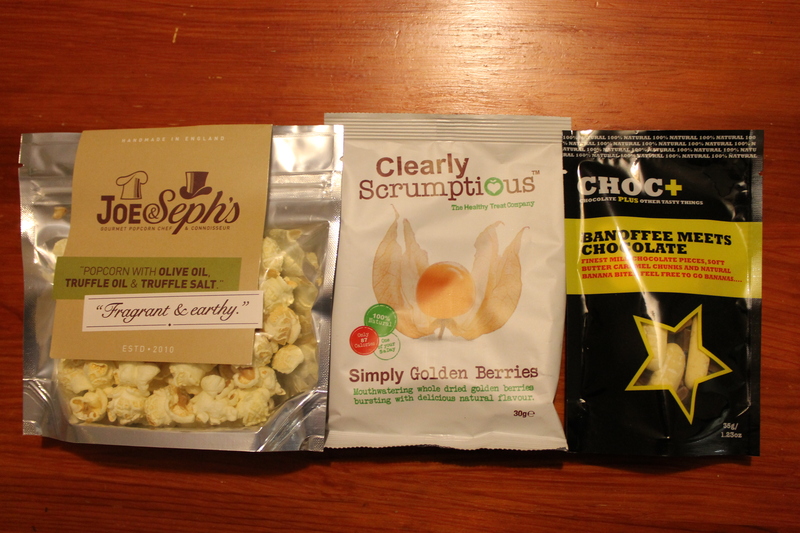 Or those other flavours/types of products from the box that you saw in the brochure and wanted to try as well.